Combining wireless control, Bluetooth music streaming and an eight-input mixer, HK’s new compact PA system covers a lot of bases! 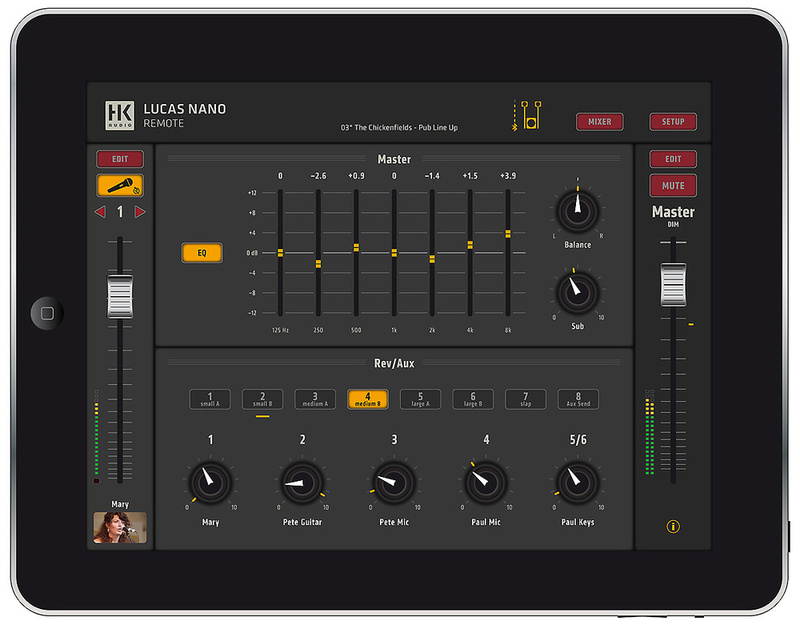 The HK Audio Lucas Nano 608i is the latest addition to the Nano PA range and it builds on the existing Nano technology to add an eight-channel mixer with iPad Bluetooth control capability. While Bluetooth has a more limited range than Wi-Fi, it means that no additional routers or other hardware are needed. If no iPad is available, all the essentials can still be controlled from the mixer panel on the sub. HK’s ‘Multicell Transformer’ labyrinth wrings the maximum performance from the small satellite boxes by shaping the wavefront, giving a single satellite a mid/high dispersion pattern of 90 degrees horizontal by 10 degrees above and 45 degrees below zero in the vertical plane. For a two-satellite stacked array the vertical dispersion changes to ±15 degrees, essentially concentrating the sound where you most need it. Despite the compact and lightweight (16.3kg) format, peak SPLs of up to 130dB are possible! The satellites can be made so small (smaller than a six-inch cube) as they cover only the 190Hz to 20kHz range, with the sub doing all the heavy lifting below that. Comprising one 10-inch sub and two small satellite cabinets, the Nano 608i system can be configured as a mono 1.1 or stereo 2.1 system, and two Nano 608i systems can be linked for stereo operation using a single TRS jack cable. Each satellite houses a 4.5-inch woofer and a one-inch tweeter and is fitted with a 3/8-inch mic-stand thread. Signal can be fed in via a Speakon socket or via the ‘Easy-Click’ connector shoe built into the base of the enclosure. An optional ‘S-Connect’ signal-carrying pole allows the satellites to be mounted above the sub and with no need for cabling. The mixer and the Class-D power amps are all built into the sub. A single 300 Watt amplifier feeds the sub and a pair of 80 Watt amplifiers feed the satellites. Being Class-D these are light in weight and produce relatively little heat, though there is still fan cooling. Overall, the system manages a 43Hz to 20kHz frequency response (±3dB) and there’s in-built protection in the form of a multiband limiter, a subsonic filter and protection against adverse thermal and overload situations. 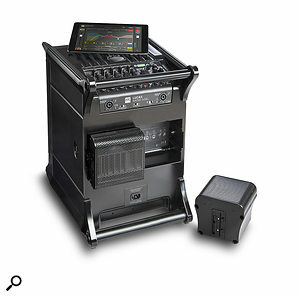 One of the most attractive features is that you can walk into a gig with the PA in one hand and a guitar case in the other, as everything — other than any optional stands or poles — packs away into a single unit. Docking bays in the sub are used to hold the satellites for transport, where recessed turn latches hold them securely in place. There’s a mechanism to lock the two satellites together and this also connects the two for use as a mono array, in which only one speaker cable or S-Connect pole is required to set up the system. You can even slide the satellites directly into the mating Easy Click ‘shoe’ on top of the sub, though that does mean either having the system very low down or raising the sub off the ground. For transport or storage, two mid/top speakers can be stored within the subwoofer.The standard of design and engineering is worth a mention as the surface-coated polypropylene enclosures are not only rugged, with perforated metal grilles protecting the drivers, but care has been taken to recess the mixer section out of harm’s way and to provide a pair of heavy-duty bar handles on the rear top and bottom edges of the sub for lifting. The sub enclosure is also well damped and internally braced to minimise resonances. 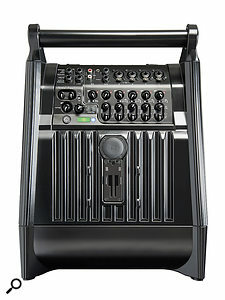 Able to accommodate four XLR combi mic/line/instrument inputs in channels one to four, the mixer has two further quarter-inch jack line inputs (channels 5/6 are configured for stereo). Channel 7/8, again stereo, is equipped with a 3.5mm stereo jack and dual phonos, but may also be switched to accept Bluetooth audio streaming. A DSP handles mixing and effects and an eight-way switch provides access to seven variants on reverb and delay. The eighth position configures the reverb control as an aux send to feed the aux output. 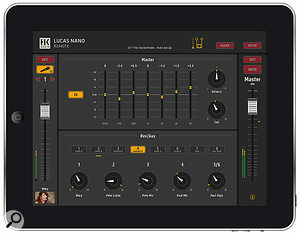 The mixer channel controls for the first four mono inputs and for stereo channel 5/6 provide access to level, reverb/aux send and a single-knob contour EQ control, but if controlling from an iPad, the user can opt for an advanced mode that unlocks full parametric equalisers and compressors. Contour isn’t a simple ‘tilt’ EQ but rather has different custom curves depending on the input type selected. It offers variations either side of centre, centre being flat. A three-way switch selects the input type (mic/line/instrument). The last stereo channel (7/8) has only a level control with a switch to select between the analogue inputs or Bluetooth streaming. Master controls are provided for volume, stereo balance and sub level and mixer settings (other than master volume) can be saved as user presets — useful for saving venue-specific EQ settings. The subwoofer/base unit also houses the system’s input connections and controls.The outputs comprise two Speakon speaker feeds in addition to the Easy Click system. There’s also a stereo line out, a footswitch/aux send out jack (configured according to the reverb/aux selection) and a TRS link jack for using two systems in stereo, where both mixers feed both speakers, doubling the number of mixer channels. Unfortunately, as I only had one system for review I couldn’t test this feature. Switches on the back of the mixer configure the system for mono or stereo operation, enable or disable remote control and switch on phantom power for the XLR inputs if needed. After powering on, a rectangular LED panel shows red and then turns green once the internal pre-flight checks have been carried out. A blue flashing LED invites Bluetooth connection if external control is selected and this lights steadily once you have paired your iPad with the Nano system. My old iPad 3 coped admirably. Whether using the panel controls or the remote app, I found the best option was to set the maximum levels using the physical controls, which override any app settings. By default the app shows a simplified edit view accessed using the Edit button above each channel fader in the main mixer view. At the top of the edit screen are controls for contour, pan and reverb/aux, while below it is a four-band, fixed-frequency equaliser with a further low-cut button. At the bottom of the screen is a single knob to adjust the channel compressor with a gain reduction meter alongside. The channel fader is displayed on the left and the main mix output is on the right. Touching the Mixer button takes you back to the fader view where all channels, the reverb return and the master faders are on display. Icons below the channel Edit buttons (which also double as mute buttons) show the type of input source selected on the physical mixer panel. The app allows access to the channel EQ’s ‘Expert’ mode. 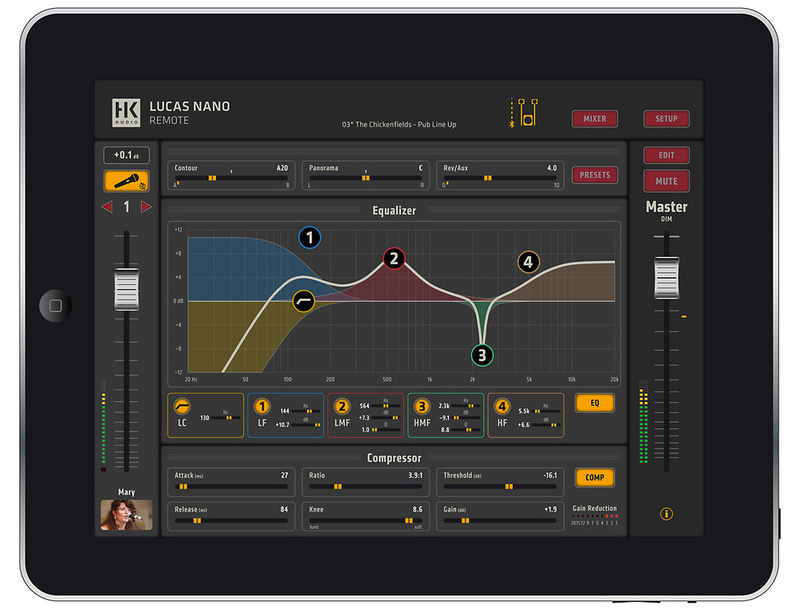 In the Setup section, you can activate Expert mode, which turns the EQ into a plug-in-style parametric equaliser complete with curve display and control over frequency, gain and Q, as well as the low-cut frequency. The compressor also receives an expanded control set comprising attack, release, ratio, knee, threshold and gain. The app also allows the storing and recalling of presets, and the Setup page allows you to decide whether or not the master EQ setting should also be recalled. 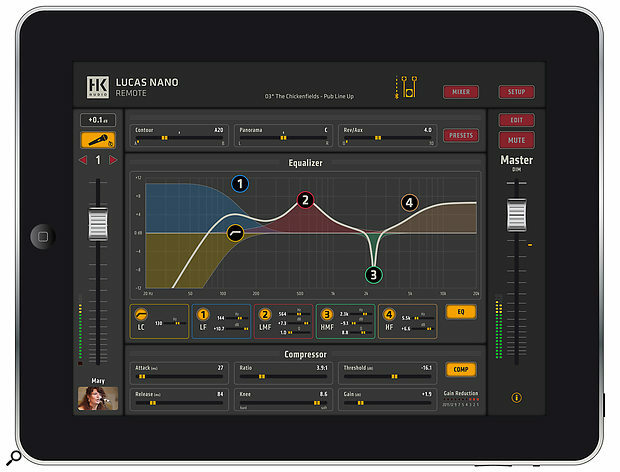 Most of the DSP settings, including the main graphic EQ, can be saved as parts of presets and then recalled.The Edit buttons relating to the reverb and master faders bring up a different screen, where a seven-band graphic EQ can be applied to the output, the left/right balance can be adjusted and the sub level tweaked. The lower half of the screen is given over to the reverb where eight buttons select the seven reverb/delay options or the aux option. The aux function can be switched between pre-fader and post-fader in the settings page. The reverb send controls for all the channels are shown as knobs at the bottom of the page. Mixing from the Nano Remote app is so straightforward that most users will probably never need to look at the manual. However, if you do feel the need for further guidance, the ‘i’ button below the master fader brings up a description of all the controls and functions. A nice touch is that you can use the camera-shaped photo button at the bottom of each fader to access the iPad camera, take a photo of the performer, and have that drop right into the channel strip. You can then add a name to replace the channel number. 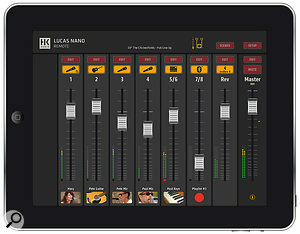 The accompanying iOS app’s main mixer page.So, driving the mixer is not a problem, and though physical control is limited if you don’t use the remote control app, you can still change channel levels, adjust the EQ contour and change effects levels, as well as select the type of effect. Sonically, the system sounds very crisp, clear and surprisingly loud, though there is some audible fan noise that might be irritating — for example when accompanying a video presentation in a small room. There’s also a little electronic hiss that remains fixed in level regardless of the control settings, though this is low enough not to be an issue and is masked by the fan noise. In a live music context these sources of noise are unlikely to be an issue. Though this is a sub-plus-satellites system, the sub really only reaches down about as far as you’d expect from a decent 12-inch all-in-one speaker so may not be the best choice for ultra-loud techno gigs. It does, however, cover just about all the frequencies generated by a typical band — and, realistically, you’re not likely to be DI’ing a bass guitar into the system unless playing at a fairly low level. Vocals come over very cleanly with great intelligibility, with the available reverbs providing everything from a short tail to a hall. Mixed at an appropriate level these all sound really sweet. Having a limited vertical coverage angle means more of the sound gets to the audience with less wasted on the floor and ceiling, which is one of the reasons this system sounds as loud and clean as it does. 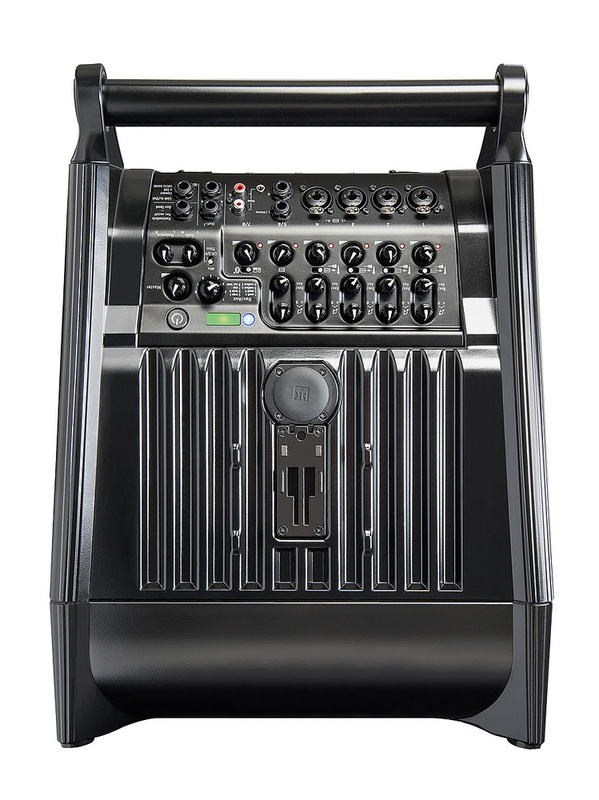 A pub band may well be able to get away with using the Lucas Nano 608i as a vocal PA in smaller venues, but I think its format favours smaller acts such as solo artists, duos or largely acoustic ensembles who need moderate sound levels and great clarity. By way of price, the HK Audio Lucas Nano 608i is up against compact column/line systems such as those made by Bose, but to my knowledge none of the competition have a comprehensive remote-controlled mixer built in. Also in its favour is ease of transport, ease of setup and the comprehensive control options, so there’s a lot to like. Louder than you might imagine. iPad only — other tablets not currently supported. An integral backing-track player would be welcomed. You can’t set up a monitor mix and use the internal effects at the same time. 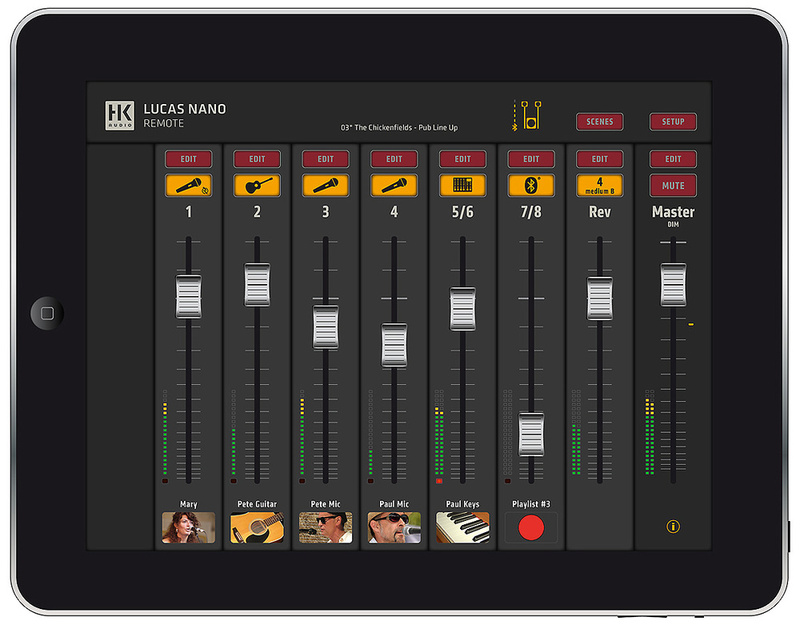 The HK Audio Lucas Nano 608i provides all PA functionality that a small act might require, with the ability to control the mixer from a physical panel or to access more detailed control from an iPad. Though there’s no monitor mix output when using the internal reverb, the main stereo output allows monitors to be fed from the front-of-house mix.